In April 2013, NCSBN sponsored the Long-term Care (LTC) Conference, “Finding Common Ground: Improving the Quality of Long-term Care through Regulation, Practice and Education”. The conference brought together diverse stakeholders to participate in discussions about some of the most challenging problems facing long-term care organizations and nurses. It was a rare opportunity for nurse leaders with regulatory, practice and educational responsibilities to discuss ways to improve the quality of nursing home care. Through facilitated discussions, participants worked together to generate ideas for establishing a culture that embraces quality of care within the context of regulatory requirements. Themes from the discussions, along with brief summaries of published research on each of the major themes, are presented in the monograph. This monograph is intended for conference participants, nurses practicing in LTC, nursing home leadership, and organizations/agencies representing nursing homes and nursing home leadership. 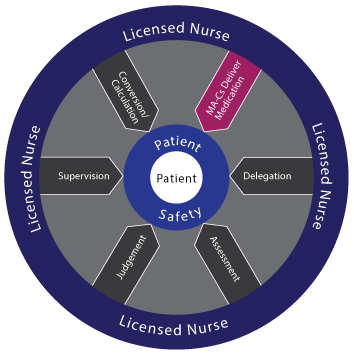 The MA-C is responsible for medication delivery of limited medications in nonacute settings, but the licensed nurse still retains the responsibilities of supervision, delegation, conversion/calculation, judgment and assessment.